Hello Everyone, welcome to you today. I have lately been pondering doing a series of posts based on my favourite game, or to be more accurate, my favourite game setting – the World of Darkness. 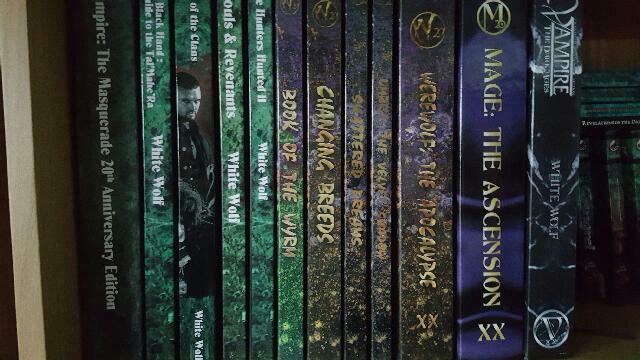 Over the years I have played various World of Darkness products, mostly Vampire: the Masquerade with a smattering of Werewolf: the Apocalypse and a cursory glance at Mage: The Ascension and Changeling: The Dreaming. If you were unaware, these are all roleplay games, usually set in a modern dystopia; a world where every unfairness imaginable is not only real, they have spirits to represent them and agents of wickedness that encourage them. These games came out in the 90s, had a great run (13 years in the case of Vampire – which was a deliberate plot mechanic) and faded into not quite obscurity. After all, the conclusion of the Storyline was basically Armageddon – the first clue was in the name of the Werewolf Game. Of course, nothing truly disappears and each line continued with an evolved story. As I was leaving University the first time and joining the ranks of drones in the world of shift work so I never got into the post Armageddon lines, so I won’t make any comment on them here. Suffice to say I fell out of the habit of playing. However, in the last few years my interest in roleplay was rekindled and I was happy to find out that Onyx Path Publishing were releasing 20th Anniversary Editions of the original games with accompanying sourcebooks. That is what I am going to be chiefly talking about. I may fish out some of the older source books, such as my well thumbed revised edition Nosferatu Clanbook, or The Succubus Club and give them the same treatment, but predominantly I am planning to talk about the newer books. Each article will be part review of product and part exposition about the World of Darkness. There is a very good reason I am going to try and stick with that style. The review is for folks interested in the article for the sake of playing the game, to help inform decisions about to buy or not, or play or not. And the reason I want to do some exposition on the world is because it will make the articles a little bit more fun for the first group to read, but will hopefully also have some appeal for regular readers or visitors who might just be a little bit interested in the lore. To put in perspective, when I was much younger I had quite a few of the Army books for the Games Workshop game Warhammer Fantasy Battle. I don’t and have never owned Warhammer Fantasy Battle, but I liked looking at the army rosters and reading the lore about the factions. It is my hope that some folks, even those who aren’t fans of(or aren’t in a position to play) roleplay games will be able to read this series and enjoy it for that reason, for reasons of story. I will be adding a tab at the top of my homepage to quickly navigate to these articles. So, that is my very brief introduction, I hope I have caught your interest and I certainly hope to see you commenting on articles, asking questions and just having a chat about one of my favourite playgrounds.